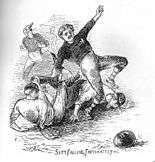 The 1872–73 season was the second season of competitive football in England. Football's second season saw the world's first FIFA recognised international match: Scotland v England. 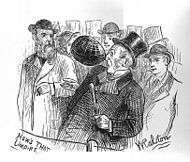 The Football Association (FA) had initiated 'international' matches between English and Scottish players since 1870, under the auspices of the FA. The first official match took place when Queen's Park, a leading Scottish club in football's development, invited the FA to pick an English team to face a Scottish team (which, as they picked the team, consisted entirely of Queen's Park players). The match took place at Hamilton Crescent, Glasgow on 30 November 1872 and ended in a 0–0 draw in front of around 4,000 spectators. 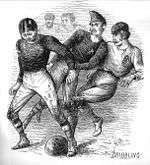 The FA hosted a return match at Kennington Oval, London on 8 March 1873, which marked the first official meeting of the sides in England, with the English adopting Scotland's 2–2–6 formation. England only retained two of the players who had appeared in the November 1872 match, Ernest Greenhalgh in defence and Charles Chenery, a forward. England selected a side with a strong Wanderers influence, including Leonard Howell, Robert Vidal, Alexander Bonsor, William Kenyon-Slaney and Hubert Heron. Of these only Heron would play more than two matches for England. The other players selected were Alexander Morten in goal, William Clegg (whose brother Charles had played in the previous match) and Royal Engineers Pelham von Donop and Alfred Goodwyn. The severely limited funds available to the fledgling SFA meant they were only able to finance rail fares to London for eight players, so the team was augmented with three Anglo-Scots who had appeared in the earlier unofficial series, Lord Kinnaird, John Blackburn and Henry Renny-Tailyour. The match ended in a 4–2 victory for England. 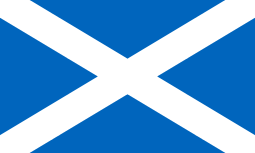 The Scottish Football Association was formed on 13 March 1873 (after both these matches) and then took over the running of the Scotland team (helping to further signify that the FA was to become an English, not UK-wide (or even worldwide), organisation). The FA Cup returned for a second season. Under the rules of the time, the previous year's winners, Wanderers, automatically qualified for the final Lillie Bridge on 29 March 1873, where they beat the Oxford University 2–0.After this season, the 'challenge' rule was scrapped and the current holders had to start in the first round like everybody else. "England match 1 statistics at TheFA.com". TheFA.com. "England match 2 statistics at TheFA.com". TheFA.com.